It has been two weeks since I arrived in Turkey, and I must say it is good to be back. Until about three years ago, I would spend three to four months every summer back in Turkey. However, this period marks the longest I have been away. So far, my time has been spent in Ankara, which apart from being the political capital, doesn’t have much to offer to visitors, especially in the winter. Over the past few years, there has been a respectable shift towards a shopping center culture where people flock to the dozens of gigantic malls that have sprouted like mushrooms across the city, in an effort to pass time and seek refuge from the chilling cold. This has slowly replaced a once lively street life and café scene, segregated to a select few parts of the city. And understandably so, as these structures abound with high quality restaurants, cafés and various other distractions, all wrapped up in a modern and appealing design. But overall, it’s the same old Ankara, ebbing unvaryingly in its mildly chaotic and mundane rhythm, save for the recent, egregious amendment to the city’s horizon, president Erdoğan’s sultanic palace, which overwhelms the night landscape with its blinding light and appalling opulence. Ankara carries a different purpose for me, however, one consisting of family, friends and tons of eating (but more specifically, being fed). From the moment I arrived, I have been contently grappling with overflowing plates filled with my favorites, ranging from melted, stretchy cheese (from the Black Sea region of Turkey) for breakfast to kilos of kabak tatlisi (a sweet poached pumpkin dessert) following dinners. Afternoons would be dedicated to kokoreç (a sandwich made from lamb intestines, cooked on a horizontal spit over a charcoal fire) or çiğ köfte (“raw meatballs” made from thoroughly mixing raw meat with bulgur and various herbs and spices), and late nights to işkembe çorbası (tripe soup) or midye dolması (stuffed mussels). Just in the first week, I ate my way through an impressively long list of dishes, and given the very eclectic range of Turkish cuisine, I only scratched the surface. The rich variety of the cuisine can be credited to a long Ottoman history of cultural and culinary fusion, a product of Turkic elements and various neighboring influences. But there is also a strong geographical component that, along with the evolution of Turkish cuisine, has not only influenced numerous specialties, but also resulted in regional specialization, due primarily to the local agriculture and resources. Yes, it is true that you can find many of these specialties in the major cities, as restaurants tend to focus on one or few specific dishes. But if you want to experience these specialties at their finest and most appetizing, you must go to the source. For the best iskender kebap, the place to go is the Northwest region of Turkey, but specifically the city of Bursa; For the most authentic çiğ köfte, a trip to the Southeast Anatolian cities of Şanlıurfa or Adiyaman; Kayseri for manti, the Mediterranean or Black Sea regions for fish, and so on. Specific kebap dishes have even adopted the names of their origin cities, such as Adana, Alanya, Manisa and Urfa. After several days in Ankara, it was time for a change. In search of a reason to head out of town, my uncle quickly set up a brief meeting in the city of Konya for late in the week. Using this work-related excuse, my uncle, aunt, grandmother and I took off early Thursday morning for a day trip, embarking on the three hour drive with the main purpose of trying the local specialties. 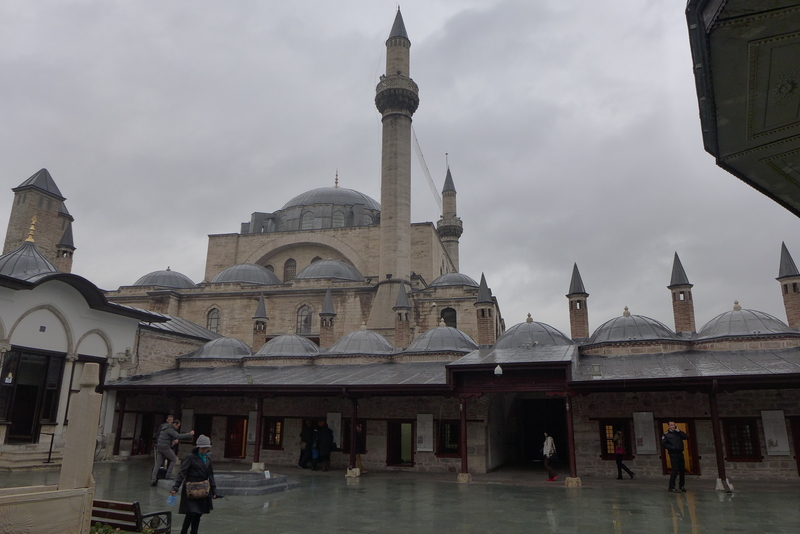 However, apart from eating ourselves silly, we would have plenty of opportunity to digest while visiting the Mevlana museum, the mausoleum of the Muslim scholar Celaleddin Rumi. 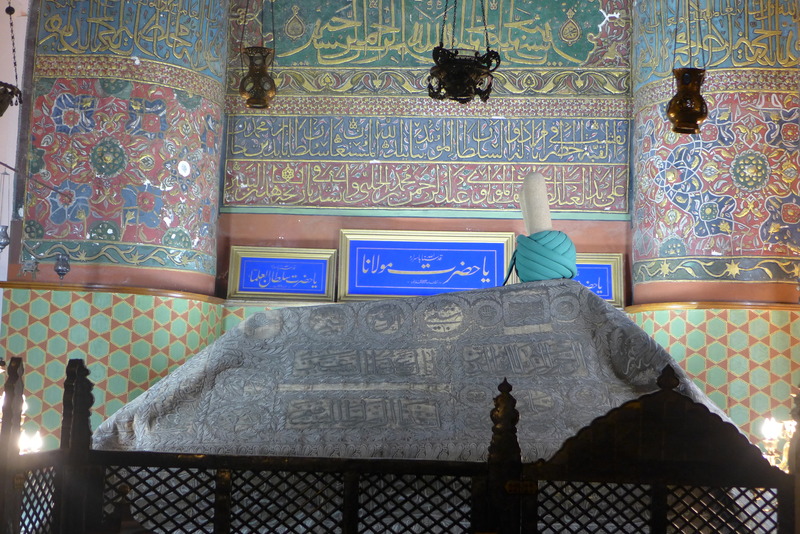 More widely known as Mevlana or Rumi, this 13th-century Sufi mystic has been the most popular and read poet in the United States for several years, and is renowned worldwide. And as luck would have it, our trip would coincide with the annual Mevlana festival, during which ceremonies are held by Mevlevi, the brotherhood known more commonly as the whirling dervishes, to commemorate Mevlana’s death. Now, going to the source is not always enough when seeking the best of the best. It is always helpful to know a local, especially one who is familiar with the food scene. 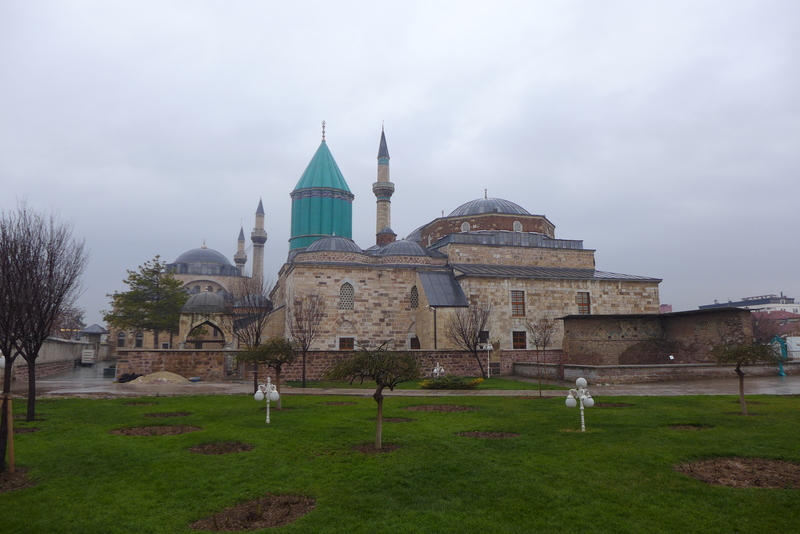 Our initial plan upon arriving in Konya was to head to the Mevlana museum, and then eat at one of the many famous restaurants across the street. However, our plans changed. After my uncle finished his meeting, which consisted of a brief inspection at a small factory, one of the workers he was in correspondence with invited to treat us to lunch. 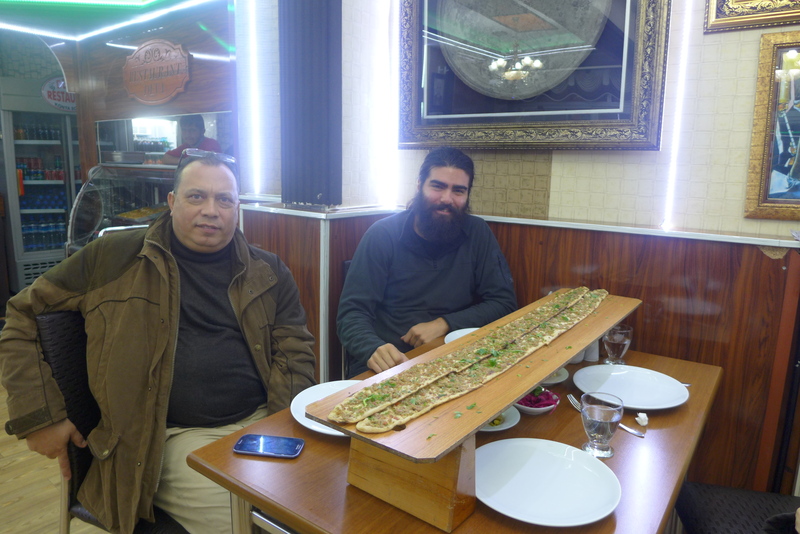 Before we knew it, we were following him to the heart of the organized industrial section of the city to try the regional specialty, kuzu tandır. As is true for many cities in Turkey, some of the best local food is found in the industrial zone, amidst the incessant buzz of factory labor, where the restaurants cater to the the local workers. 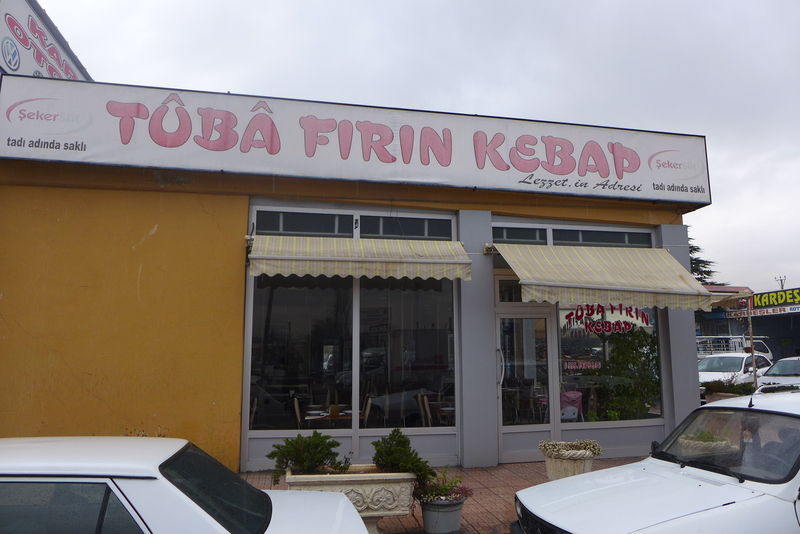 After driving for a few minutes through the rows of factories that lined the wet, narrow, beat-up streets of the Karatay industrial zone, we arrived at our destination – Tuba Fırın Kebap. Kuzu tandır, also known as fırın kebap, is a type of kebap prepared using meat from the arms and ribs of young sheep. The preparation at Tuba Fırın Kebap begins each morning before the sun rises, around 4.30 a.m., where the diligent cooks gather the large, portioned sections of meat and quickly yet meticulously remove the bones. During this process, the boneless slabs of arm and rib meat are placed into a very large copper pot that is first seasoned with rock salt. Once the pot is filled to the brim, it is placed into a wood-fired oven and, without any addition of water, left to cook in its own fat and juices for 5 hours. Once the juices fill the pot, a slow boil from the bottom and a roast on top, combined with a continuous bottom-to-top mixing and rotation of the meat, allows for a homogenous preparation. Without forgetting the only addition to this broth, the rock salt slowly diffuses into the mixture, evenly dispersing throughout. 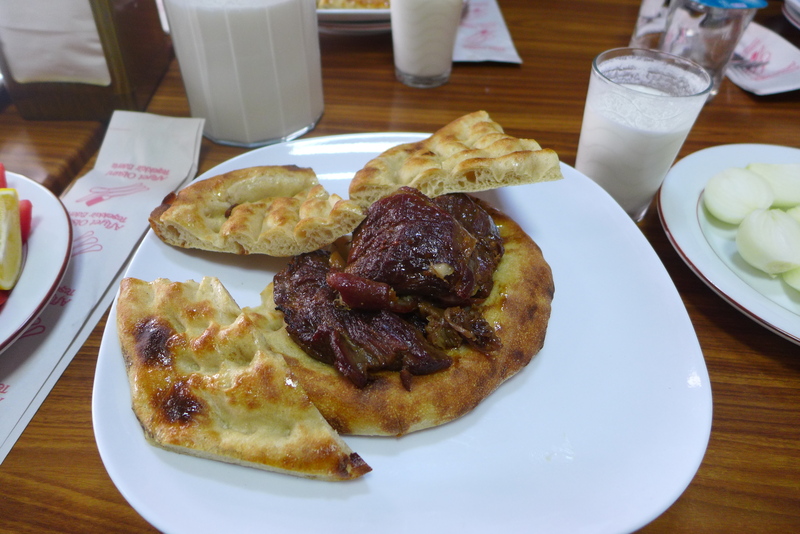 Once finished, the meat is lined onto freshly baked pide bread that soaks in the juices, and is served with ayran, a traditional yogurt drink. This tandır was one of the most flavorful servings of meat I have ever had. Having eaten very good tandır many times in the past, I wasn’t sure where to set my expectations. But these chunks of lamb, having been softened by hours of slow brewing, came apart like cotton, and combined with the very slight, uniform crispness on the surface, provided an ideal texture. The pide bread, once removed from the oven, is lightly brushed with the fatty juices straight from the copper pot, but gets its real flavor from what it absorbs straight from the meat, making for a great pairing. The flavor was like no other. Although one can order a less fatty portion, the serving can be a little overwhelming for some, but should be no problem for those with well conditioned stomachs. Just as the local workers and dedicated customers swear by Tuba, my uncle also admitted that this was better than the other tandır restaurants he had tried in Konya. 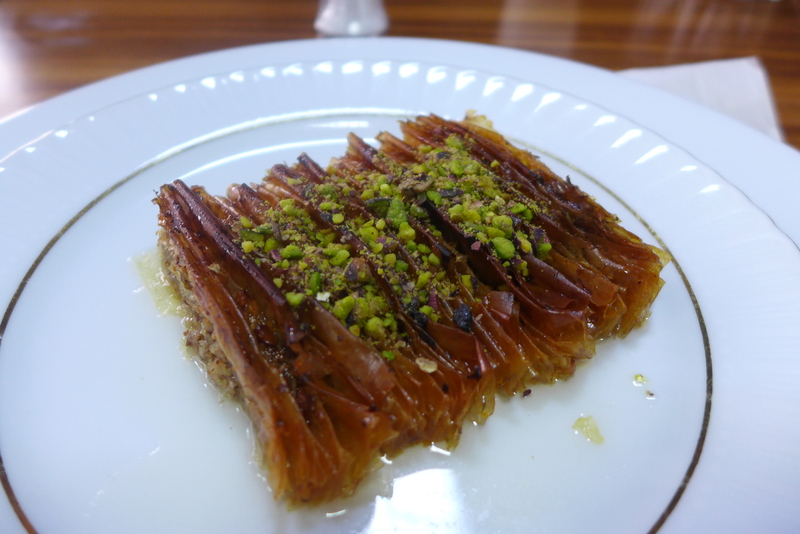 Apart from kuzu tandır, the only other dish served in the restaurant is saç arası, a dessert uniquely found in Konya. Prepared from the phyllo dough used to make baklava, the dessert is filled with either walnuts or pistachios, and is then cooked with butter in a wood-fired oven, finally complimented with an addition of syrup before serving warm. Needless to say, this dessert was incredibly rich. 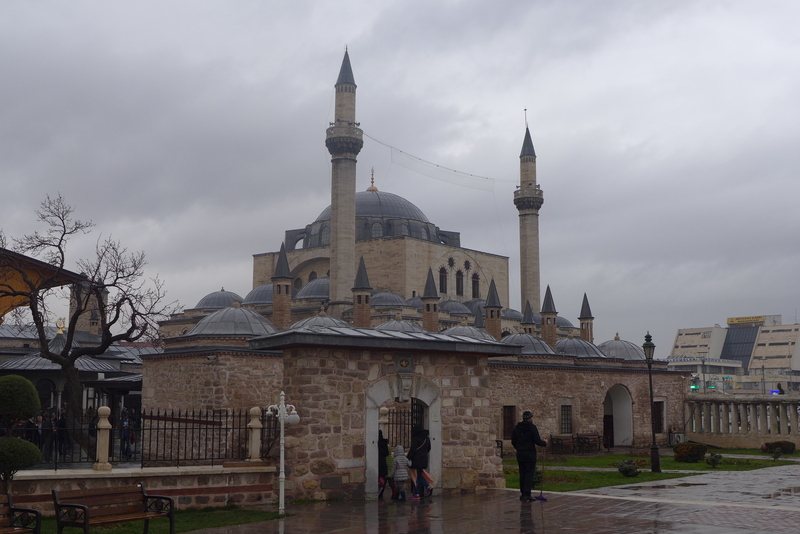 Pleasantly stuffed, we went into town and arrived at the Mevlana museum just as a torrential downpour bombarded the city. For the next few hours, we visited the small mosque, mausoleum and ritual halls and rooms that make up the museum. 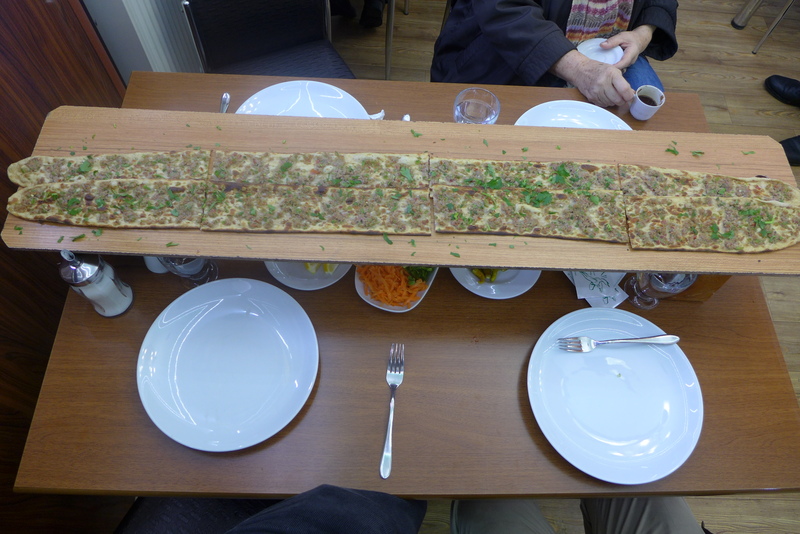 Giving ourselves just enough time to digest, we left the museum in search of our next meal, etli ekmek. Now we are talking about what Konya is really known for. Measuring in at a meter long, this thin, crispy pizza-like creation is served on a long slab that extends off the sides of the table, elevated by two blocks on either side. Made from thinly spreading out a piece of dough and topping it off with minced lamb meat, vegetables and herbs, the etli ekmek is placed in the oven with a long baker’s peel, and before long the simple yet savory, crisp-crusted delicacy is ready. 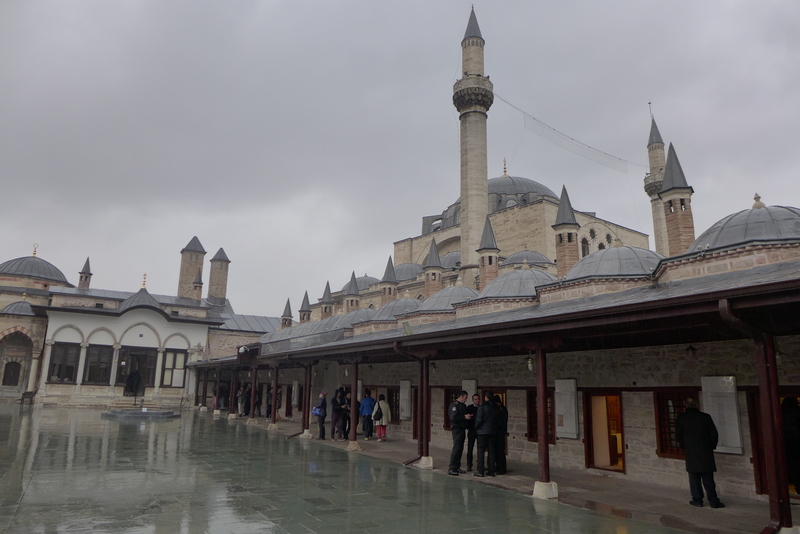 Although brief, this trip to Konya was neither rushed nor lacking. I’m sure the city has other attractions to offer, but it would be hard to top the content, lethargic feeling following such memorable meals. sounds like a lot of great meals and having fun with relatives…..